Roman Armstrong’s The Greatest Tory Ever Told was a punchy story — or should I say ‘tory’ — that provided many valuable comedic moments which were well received by its audience. 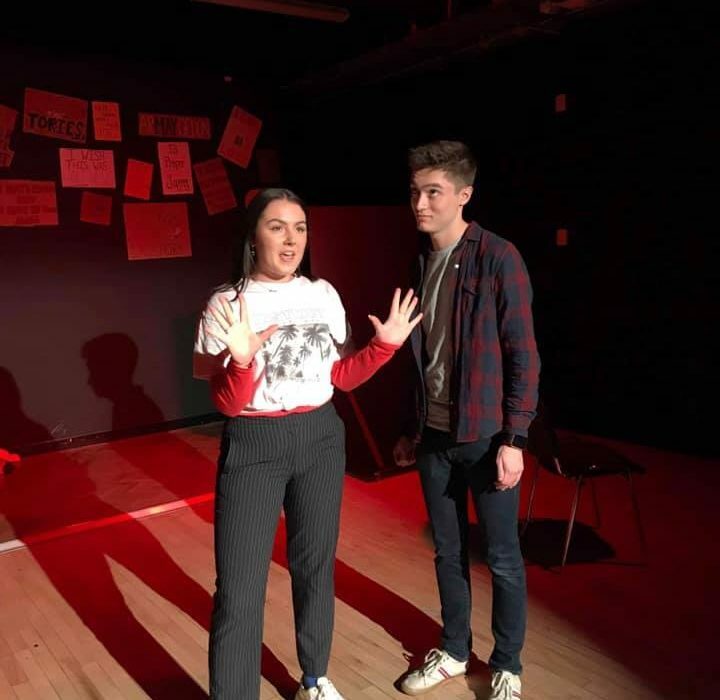 This being said, the plays themes ran deeper than its entertaining front, dealing with issues such as social exclusion, differing opinions, and acceptance. This provided some more thought-provoking, if not touching, moments. About three weeks into his first semester, Cameron Davidson experiences a chaotic and frustrating day. In his morning lecture, he is challenged to prove that he is ‘not a tory’ by the head of the Labour society, Yvonne. Instead Cameron ends up forming a close bond with the sole member and head of the Conservative Party, Donny. Not only this, but he is also kicked out of his halls by his own mother, played convincingly by Eloise Russell (who has started dating his flat mate). After a house party, a close encounter with death and a strange experience with Gareth’s eagles, order is restored with a message of accepting each others’ opposing opinions. The pitiable yet hilarious character of Donny (Kwame Owusu) was especially well written by Armstrong, the crazy succession of plot twists demonstrated an inventiveness and eye for comedy that was outstanding. Both Armstrong and Evie Appleson’s direction, showed informed attention to detail, from the feuding, red and blue lighting to the ironically theatrical puppets used to illustrate the scene of Donny, Cameron and Gareth’s struggle in the rapids of a river. It was clear the creative team had approached the script with a very clear image of what they wanted, and this enabled a comfortably assured performance from the whole cast. Kwame Owusu delivered an impressive performance as Donny, the sheltered Conservative party leader. His impeccable comic timing and outstanding focus, meant he fulfilled the challenging aspect of his character fulfilling some of the funniest moments, contrasted with uncontrollable fits of rage that could only be soothed by a relaxing cup of PG Tips. Making a small assumption that the audiences were largely left wing, Owusu’s ability to make such an audience pity the, at times, ignorant (Tory) Donny, is validation enough of Owusu’s skills as an actor. Another outstanding comedic performance was that of Ross McFadden as Gareth – aka Lord Grindolf, the enthusiastic head of the Fantasy Battle Re-Enactment Society – who’s omnipresence in the plot acted as a welcome satire of Cameron’s conscience. McFadden created a character that was both overly dramatic and unexpected, he was positively greeted whenever he appeared onstage. Ciara Ewing as the intimidating Yvonne and Nick Bond as the suitably named Cameron Davidson, settled comfortably into their main roles. They delivered informed performances that held the plot together and gave it a successful arc of action. Their juxtaposition of character highlighted the relative traits of both personalities well. Daisy Jones as Holly and Abi Brinan as Gracie delivered contrasting characters that acted as a perfect opposition to each other, and to both sides of Yvonne’s character. Jones portrayed the snide character of Holly with impressive assurance and confidence, while Brinan’s more gentle portrayal of the modest, eager-to-please Gracie created an extremely likeable, endearing character. A mention must also go to the integral role of the ensemble. Though a small group, the three members (Sam Grieve, Daisy Shuttleworth, and George Clark) really owned the space and gave the impression of big crowds, especially in the party scenes. Their use of synchronised movement and mastery of vocal skills were also commendable, delivering an opening sequence that really set the tone for the whole play. Fundamentally, Armstrong’s play was a relevant satire of the two main parties of Parliament and the place they hold in the younger generation, as well as an entertaining outlooking on the looming ‘Brexshit’. The play was exceedingly well cast and the interplay of its informed visual and audio aspects meant the colourful plot line came across as comfortably assured.